ventured down those 'middle aisles', because they were filled with the worst of the 'fake' foods (explained eloquently in books like Food Rules: An Eater's Manual). Scratch cooking really did become second nature to me, and it felt great, like I was conjuring up the spirits of my grandmothers. I baked, pureed, stocked up, froze, fermented, canned, foraged. I felt so great about my family's diet, and I wanted to share to the world that everyone could do it, if they only tried. 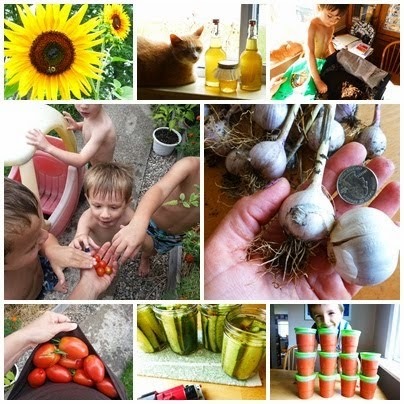 I was settling into a niche that I really liked, as an urban homesteader (and even got mentioned in cool articles like this one!). Then my world inverted upon itself. My lifestyle took a really huge step back--or if not back, it at least went into a reality I hadn't know for years. I re-entered the mainstream. It wasn't exactly sudden; the transition has been taking place over a couple of years. My at-home lifestyle was possible only because I had my own business for 13 years, and that business came to a natural and needed end last year, when I closed my beloved daycare for good and got a job in the public school system. I knew my ultimate goal was to become a teacher, because that was what I'd trained to be so many years prior, but I had no idea how quickly my dream would come true. This past August, I was hired as a full-time third grade teacher. I could barely believe my good fortune in getting a job so quickly. I'm still in a bit of shock, as I've dreamed of teaching practically as long as I've been breathing. Diving into the job, and the hurricane that came with my new title, cannot possibly be described without giving it a whole new blogpost. The emotions, the 14 hour days, 70 hour weeks including living at school on the weekends, the fears, tears, doubts, terrors, nightmares, and heartbreaks could fill a book that I am not ready to write. I am just now, 2.5 months into my 'dream job' of teaching, starting to feel like I have some kind of footing. My family's diet? Oh boy. I don't think I've properly grocery shopped since the day I was hired as a teacher. Learning the ropes of this job has taken over my entire existence. Many nights for supper we've eaten pizza rolls. Ramen. Taco Bell. Even....wait for it...McDonald's. Ugh. I haven't had time to react, or recoil. I've had to accept this step back in nutrition. We are a family in survival mode. My complacent foodie self has come head-to-head with my working-mom and busy family self, and for now, we are not strangers to the factory food lifestyle. I've tried to set a simple goal--to make something from scratch at least once a week. And 'from scratch' now means I open a can of tuna and stir in some mayo and relish so that my kids can have a break from frozen fish sticks or takeout pizza. Long gone are the days when I have time to prepare anything more complicated than a pot of chili. As life calms down, perhaps I'll figure it out. I am proud that we did harvest our sweet potatoes last week (even if it did throw out my back and take away precious grading time), but I panic to think of when I'll find time to prepare those beautiful sweet potatoes. I crave sweet potato-chickpea curry, but the clock says NO. It took all my will to take a minute to write this post. I've been missing the blog like crazy--my absence from writing hurts almost more than my absence from the garden and kitchen. As I navigate this new life, I hope to figure out how to keep my family healthy and to get back to my money-saving, garden-growing, scratch-cooking ways. At this moment in time, though, I am focused on being the best teacher I can be, and it's sucking me dry. If I ever made a healthy lifestyle seem easy, and if you as a reader felt pangs of guilt, I apologize profusely. I get it now. You work, you survive, you strive to do the best you can. I am WITH YOU. Please comment about your own struggles to find the balance. We could really use each others' support right now, without any judgement! Thank you so, so much for this post, Andrea! Your candidness and honesty are so refreshing! I understand completely what you are saying and how torn you must feel at times, and I am SOOO proud of you! Clearly you are doing the best you can possibly do . . . just like the rest of us! And I am sure that you are just ROCKING IT and doing what is right for you & your family & your students. I stopped writing on my blog a while ago too, but for different reasons (life happens and sometimes one has to make choices). Some days it bothers me too, but most days, I KNOW I had a good reason and I don't sweat it. You shouldn't either. Enjoy everyday and always look to bright side! We love you and are thinking of you! Jo, your support means more than you will EVER know! You've been a cheerleader for me for going on three years now! Thanks for being you, for being real, and for always being a voice of reason. You rock. Thank you for giving voice to something that has seemed shameful to me. Due to illness, the same has happened to my husband and I. This is exactly the time we need to be eating the healthiest, but it's impossible. Our garden was a failure due to lack of care, and what we did pick mostly went to waste if we didn't give it away. It's definitely survival mode right now, but I WILL be back in the swing of things someday!! While our circumstances may be different, we are both in survival mode. We can only do the best we can to get through each day...with love and hope, not guilt or remorse. Thank you so much for your comment, and hang in there! I try to feed healthy food to my family. Working full time and with the occasional craziness of life sometimes makes that not possible. But hey, they're fed and we try again tomorrow. This doesn't have to be an all or nothing thing. has your name from the digital dial. However, this does not necessarily mean that the watch is also operated digitally. You can combine this type of watch with puristic outfits in black or white. So the special look of the replica-rolexcomes over well. Pass Juniper JN0-102 Dumps Questions It’s very excellent information and more real facts to provided that post.Thank you for sharing this information. I wan to go to the Pizza roll to Organic Scob. I mean I am just addicted of pizza rolls.